Beervana Buzz: Laurelwood's "Brave New World"
As some who read this blog surely know, Laurelwood's flagship location on Northeast Sandy is in my hood. So it's obviously one of my regular stops. You get to know the regulars on both sides of the bar at a place like this. It's almost a Cheers situation...a personal comfort zone. They've been making some changes at my favorite pub. It's tough not to notice. 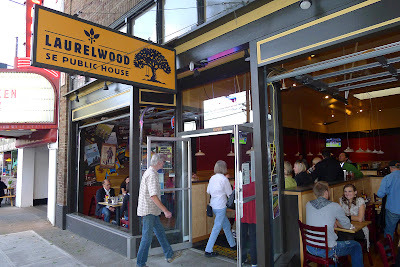 And these changes really aren't connected to the new (very nice) pub down in Sellwood, which opened a month or so ago. Nope. They're tinkering with a bunch of things at the flagship. I happened to run into owner Mike De Kalb the other evening and asked him about what's happening. I should probably preface this by noting that brewers are almost always to blame when changes are made, and I knew Brewmaster Vasili Gletsos had to be involved. So I asked Mike if he had possibly lost his mind and let Vasili run wild. I'm kidding here, but you get the idea. Mike said he was giving Vasili some room to explore and implement his ideas for moving the business forward. An email to Vasili was quickly returned with some details, which I shall get to shortly. 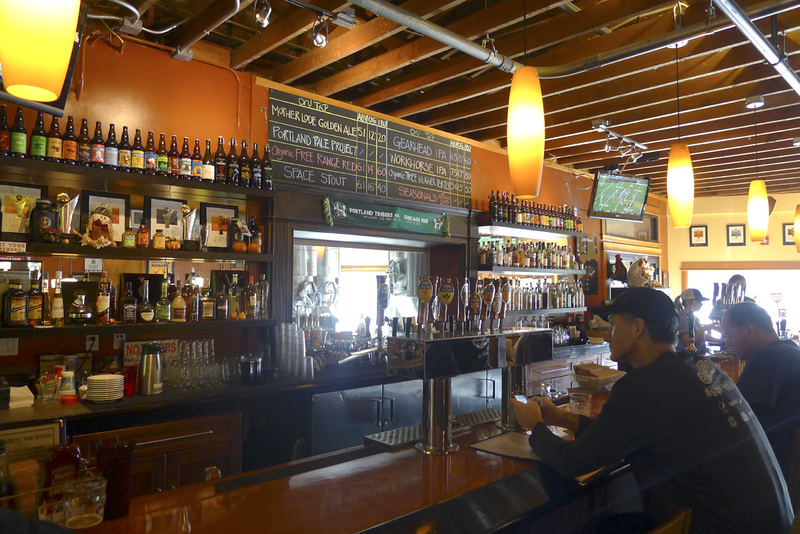 The big news is that Laurelwood is paring down its list of standard beers. Pale Ale...gone (actually, different versions will rotate). Hooligan Brown Ale...gone. Gearhead IPA...very soon gone. I'll get around to the IPA implications in a minute, so hang on. What they intend to do going forward is limit their core focus to four or five beers, which will free them up to produce more seasonals and specialties. The cool thing about the seasonals is they are a team effort. Vasili will write some of the recipes with input from his brewers and the brewers will write some of the recipes with input from Vasili. Some of the beers may be fantastic and some may not be to everyone's tastes, he said. But it should give the team more strength and versatility in the long term. Their approach to standard beers is also evolving. Vasili believes they should always be striving to make beers the best they can. Raw materials can vary in quality and availability. Thus, he doesn't mind varying the hops or malts in a recipe if he thinks it might make a beer better. So there may be some minor variation in even the standard beers. That's not a bad thing. The big picture changes are perfectly in line with what is happening around Portland. 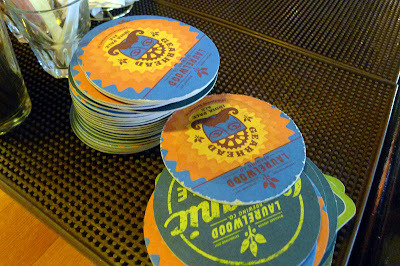 Today's beer fans are seeking out seasonals and specialty beers in breweries and pubs. Well-known standards no longer cut it, as they did a few years ago. You have got to keep things interesting if you want stay relevant in this business. That's where Laurelwood is headed. Gearhead is going away (already gone from their website) because they are bringing Workhorse back as their distribution IPA. A little history here. Gearhead was introduced just over a year ago when Laurelwood ran short of the aroma hops used in Workhorse...those being Amarillo and Simcoe. Gearhead is a smaller beer that uses more traditional Cascade and Centennial hops. Officially, they always intended to bring Workhorse back as their standard IPA...once the hops became available again. I was never quite sure how they would do that, but it makes good sense. See, Gearhead simply isn't in the same league as Workhorse and it never gained a large following. 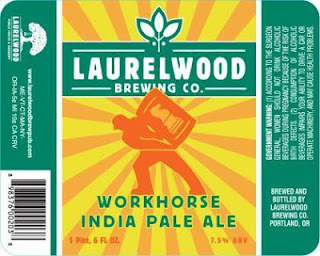 Workhorse is an iconic beer, one that has brought Laurelwood significant recognition. The fact that some of the ingredients can be more difficult to source is just part of the bargain. 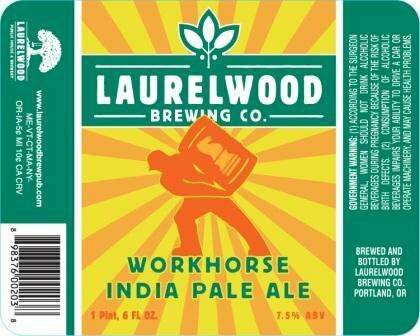 When Workhorse was on hiatus, they eventually made it available at Laurelwood pubs. But you couldn't find it in bottles or in pubs around town. My first clue that a change might be in the wind was when I discovered they were pouring Workhorse down at Blitz Ladd. Anyway, the beer will be back in full distribution soon, although I'm not sure of the specific timetable. Some people are going to miss Gearhead. Its lower alcohol (6.5% ABV) content makes it a sessionable IPA (meaning you can drink a fair amount of it and not get hammered). By the way, Gearhead will likely be brought back from time to time as a seasonal beer. Good news for fans of the beer. Discontinuing Gearhead and paring down the list of standards is a smart move, and one they probably had to make. Why so? Because Laurelwood's production capacity is pretty maxed out. The Sandy brewery produces essentially all of the beer they sell in multiple pubs and distribute by bottle. Streamlining production makes good sense. "With Workhorse, it's much easier for us to focus on and produce more of one beer then it is to split the fermentation capacity and everything else among two brands that are more or less the same style of beer," Vasili said. Workhorse is certainly the right choice if you're only going to make one IPA...in my view. The bottom line is this: Laurelwood needs a production brewery. They have expanded distribution to the point that they need more production capacity. I know Mike is working toward getting a production facility off the ground, but the timeline is uncertain. Meanwhile, they've got to feed the monkey, as it were. Other add-ons at the Sandy pub include a beer engine and some revised signage. These are good changes, as they add to the functionality and appeal of the place. Part of the reasoning behind the beer engine is the house yeast...English Ale yeast. This strain is perfect for subtle English ales (duh?). So they've got a cask program in place and will be rotating different beers through. They recently had a cask version of Workhorse and then an organic version of Treehugger Porter with vanilla beans. "The cask program gives us the opportunity to use different dry hops, or anything else we want to try," Vasili said. "I can imagine some nice beers coming out of this program. I'm looking forward to a Red dry-hopped with Cascades and Centennials, which will go on this week, as well as a stout dry-peppered with a very fruity black pepper, almost like a prune flavor with a touch of heat." Above the bar, you'll note the board of standard beers has been revised. It now lists the beers with basic stats. No more frilly pictures, which were artsy-fartsy, but also took up a lot of space. "The standards board had all those wonderful pictures which were nice, but becoming obsolete and conveyed no information," said Vasili. 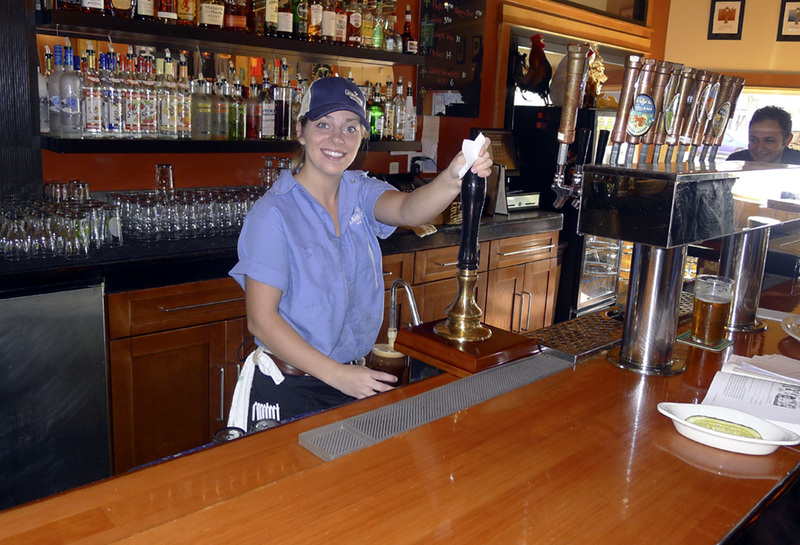 "I think our customers prefer being able to see more about the beer...and less. The new board accomplishes that, I think." The old seasonal board near the end of the bar has been replaced with a larger one on the wall that fronts Sandy Blvd. This was a necessary change. 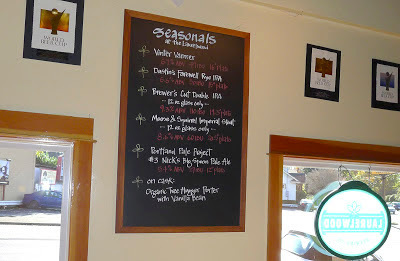 The old board was too small to list all of the seasonal beers and sometimes difficult to read for a variety of reasons. The new board is out in the open and much easier to read and absorb quickly. It seems to me the things they're doing at Laurelwood will enhance and extend the reach of their brand. Staying relevant in this beer economy means constantly evaluating where you are with your beers, your people and your facilities...and making adjustments where they make sense. As Vasili said in closing his email: "It's a brave new world." Wow, dumping OPA so recently after its big roll-out. That's a shame; it's one of the best pales in Oregon. Man, I really enjoyed Gearhead...one of my favorite IPA's to snag at the store. That's too bad. Chris: I'll be honest and say I do not care for Gearhead. I much prefer the aromas and flavors of Workhorse. Nonetheless, I get why some people really liked Gearhead and will be sad to see it go. Jeff: I agree with you on OPA. I believe we both ranked it highly on a list of new pales for 2011...or some such list you compiled. I'm not a big fan of cask beers. Vasili provided the yeast commentary. My guess is he intends to produce a variety of beers for the cask program. Hopefully, some of those will be what you're looking for. Cheers for the comments, guys!